After one full day of racing at the 2011 Melges 32 North American Championship, hosted by Sail Newport in Newport, R.I,. 20-year-old Ryan DeVos along with tactician Ed Baird on Volpe is officially in charge. Leading by an impressive 8 point margin, DeVos currently reigns over Rod Jabin on Ramrod with tactician Chris Larson in second, and Alexis Michas on Zetiana with tactician Brian Ledbetter is third. "Fortunately, we just happened to be in all the right spots. Today was all about location." said DeVos. PRO Bruce Golison and team fired off three brilliant races just outside Narraganset Bay Sound to commence the championship. "The three races we had today were great. I thought they went off perfect." said Jabin. "At this point second place is not so bad. It's great to have the crew back. Today was all about patience." Race one started under overcast conditions and moderate temps. For the last two days everyone was concerned about the breeze, i.e. how much there would be and whether or not there would be enough to produce any racing. A pleasant 8-10 knots filled in nicely with DeVos coming on strong, right out of the box to win. Steve Howe's Warpath did well taking second and Bill Canning on Wild Horses took third. For Canning, it was his first time to race competitively within the fleet and conservatively speaking, he did quite well landing mid-fleet after three heats. 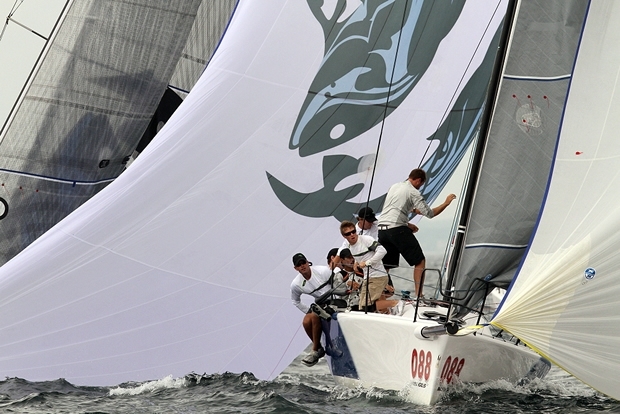 The remaining races of the day saw the breeze shift further left resulting in Benjamin Schwartz's Pisces acquiring the lead, then going on to win race two. Steve Rhyne's Mojo took home a well-deserved second place finish. In third, is Ryan's younger cousin by two years, Dalton DeVos on Delta. For the final race of the day, DeVos sailed a great race to take the lead from start to finish, then ultimately the win. "We had a bad start on the last race, but Ed called the layline about a mile out from the weathermark." said DeVos. "He makes it easy for me. It's all about coming out tomorrow and doing the same thing again." Michas captured an incredible second place finish followed by Jabin in third. After racing, teams enjoyed great food and complimentary beer supplied by Newport Storm at the Newport Shipyard. Racing continues on Saturday and Sunday.